Partially optimized RFP sequence, based on E1010. Mutation-optimized to have a 12% reduction in the number of possible pyrimidine dimer-forming sites. To generate this RFP variant with enhanced mutation resistance, we made synonymous codon substitutions to the commonly used E1010 RFP sequence in the registry. These sequence modifications were preformed by a computer algorithm developed by the Vanderbilt 2015 team. The algorithm removed sites that, upon UV irradiation, could possible form pyrimidine dimers, including CT, TT, CC, and TC base pairs. Each pyrimidine dimer sequence hotspot was assigned a weight corresponding to that particular hotspot's mutagenicity. These weights were taken from previously published quantum yields of each photodimer, as determined by HPLC-MS/MS (Douki 2013). We used alkaline gel electrophoresis following incubation of irradiated DNA with the enzyme T4 PDG to quantify the amount of mutagenic lesions in our DNA sequences. 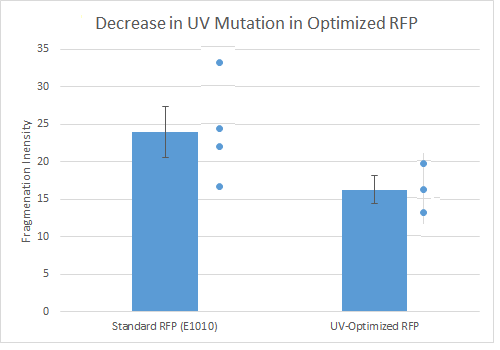 The results shown below demonstrate a notable, but not statistically significant, decrease in the formation of UV-dimers in the K1673010 sequence relative to the original E1010 sequence. We first check for the successful integration of our synthesized sequence for K1673010 first by restriction digest. A band was produced at 2.8 kb, as expected for the sequence in pSB1C3. We then sequenced the gene from the forward and reverse ends using VF2 and VR primers. This sequencing conclusively determined that our optimized sequence was present and in the correct orientation. The sequence for K1673010 was designed before our software had its optimal rules for maintaining expression put in place. Consequently, the level of RFP fluorescence at 645 nm was only approximately 20% that of E1010. Later improvements, notably K1673102, was able to increase expression to closer to 80% of E1010 expression.